A geode is a round rock that, when split open, reveals a hollow cavity lined with crystals. This multilayered soap cleverly mimics a natural geode, with a colored outer shell, an interior layer of another, and clear geometric soap “crystals” sprinkled through the center to add to the realism. A perfect gift for your favorite rock hound – if you can bear to give it away – this looks startlingly like the real thing. In fact, when we took them to a market, most people thought they were actual rocks – high praise indeed! 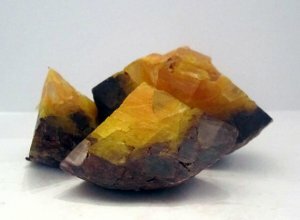 Colors: An outer shell of coppery brown, an interior layer of golden yellow, and clear “crystals” sprinkled through the center. Lightly scented with Amber Romance: a rich combination of amber, African vanilla, and musk with a faint undertone of black cherry.